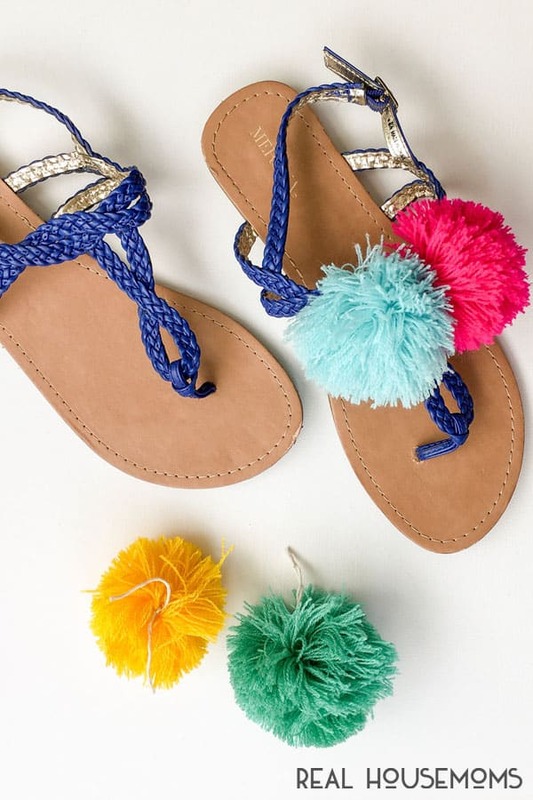 Revamp your favorite summer styles with these 3 Ways to Wear Pom Poms! These easy tutorials will breath new life into your wardrobe! Like it? Pin this post to your DIY pin board! 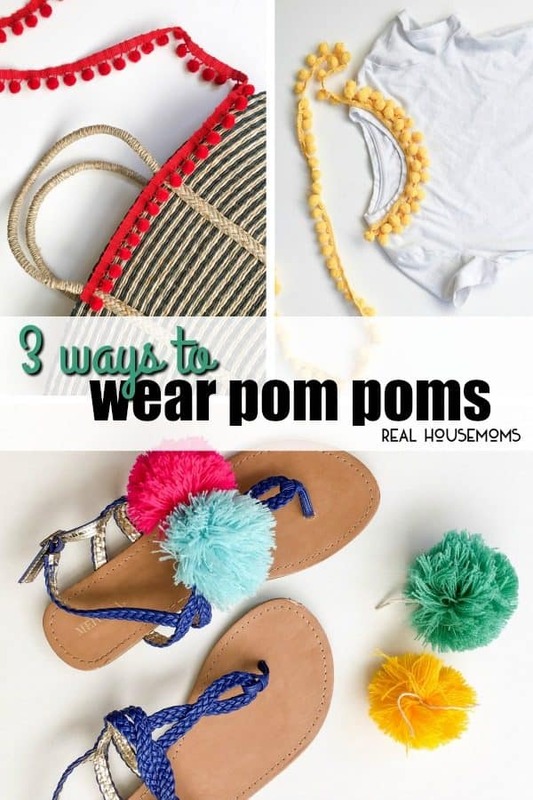 Summer is in full swing and if you read my last post, I’m not gonna keep you away from the summer but let’s get real friends… I love to craft and today, I am showing you 3 Ways to Wear Pom Poms this summer. Maybe you don’t love to craft or maybe the thought of “crafting” intimidates the crap out of you, but oh girl, no worries because this has “novice crafter” written all over it! To advance crafters, SKY’S THE LIMIT! And to everyone in between, if you haven’t given this playful pom pom trend a try you should, if not for yourself then for your family! YUP. Everyone is invited for the fun. 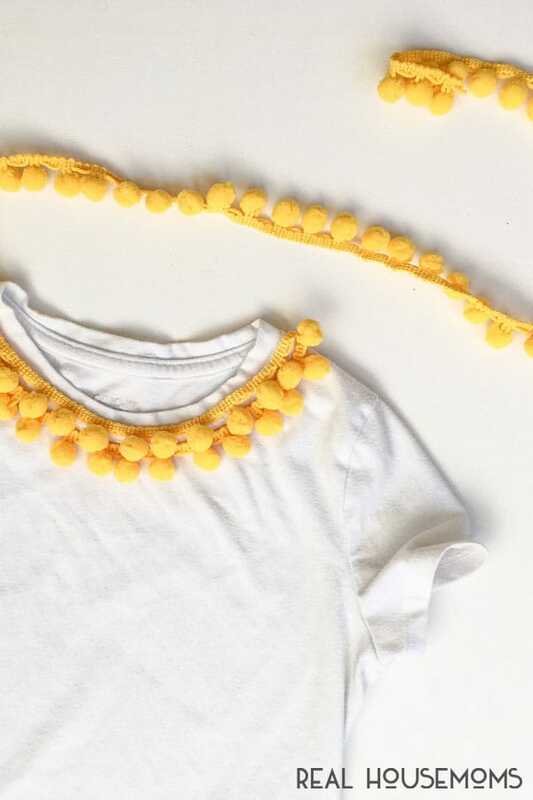 Pom Poms is the easiest crafting trend to jump on board because they are a snap to whip up and easy to buy already made! So let’s get started. the sandal of your choice, bonus points if you grab a heel! I’m not gonna reinvent the wheel for you but you can make your own pom pom with one of the four methods found: HERE. Once you have your pom poms, do not cut the long tails you used to make the pom pom. Those tails will allow you to attach this fun detail to your sandals. Make it as small or big as you want! Never fear my dear, I’ve got your back as well. Guess what? They also sell this fun trend by the yard! 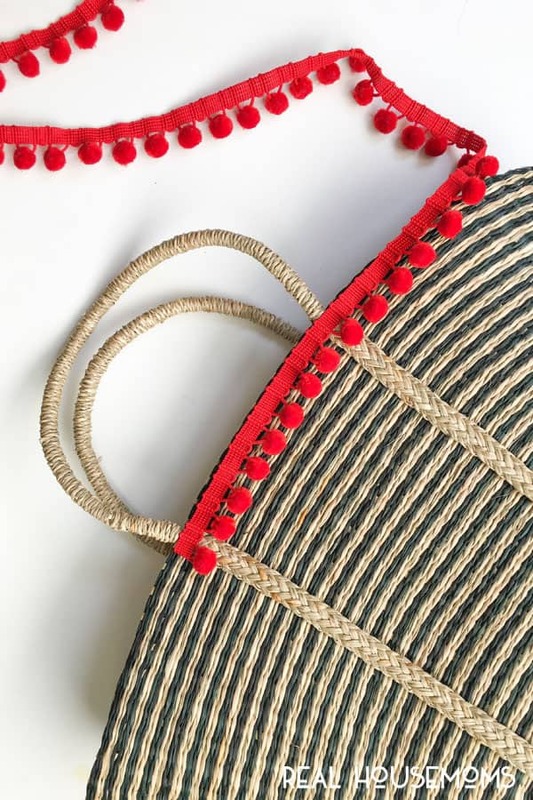 Whatever you want to do as far as applying this trim is up to you – sewing and gluing works! You know… those Project Runway designers are no stranger to glue. So if hot gluing is your love language, then GO FOR IT. And finally, this was a blouse idea I spotted in People Style Watch Magazine a few months back. Except if you already had a t-shirt that needs some updating then it’s PERFECT and cuts down on cost. Whether you choose a solid color, stripes or a fun print; It ALL WORKS. Below, I have a couple layers of this trim along the front neckline. It’s BEST to pin and sew one row at a time. Now now that I have your PomvPom attention, why stop at THREE tutorials! The following are my favorite new ways to add some pom pom goodness! The list could go on, but I am totally loving these the most! Until we meet again, thanks for stopping by and have a fabulous day!